Currently, the final verification of insolvency table is being conducted by the Official Receiver while all main objections have been settled. During the last 5 years ABM Solid S.A. has undergone a thorough reorganization and is in the final stage before a Meeting of Creditors which will approve the so-called “composition.” At the turn of 2012 and 2013 the Company faced bankruptcy including liquidation of its assets and termination of operation. The process was put of halt and the bodies supervising the Company made a decision about the possibility of entering a composition. ABM Solid continues to be an interminably active business entity performing numerous contracts, also contracts abroad. The length of the proceedings was due to a time-consuming process of determining the final insolvency table by the Bankruptcy Court. A Meeting of Creditors may be convened at the turn of the year. At this phase of the proceedings, the Company carries out consultation with a group of creditors and gathers information regarding their possible participation at a Meeting of Creditors. April 18th 2012 ABM SOLID S.A. signed contract with PORR Polska S.A., general contractor of the habitation, office and services complex Browar Lubicz in Kraków, on execution construction works. Total net value of the contract is 13.500.000 PLN, and it’s realization will be executed till December 2012. Scope of works contains open shell construction works with tower crane and other necessary materials and equipment delivery. 12 marca 2012 roku ABM SOLID podpisał umowę z Towarzystwem Przyjaciół Stężycy z siedzibą w Stężycy. Przedmiotem umowy jest realizacja w charakterze Generalnego Wykonawcy inwestycji pn. „Starorzecze Wisły – Aktywna Rekreacja w Stężycy”. Zakres robót obejmuje między innymi budowę amfiteatru dla 3 tysięcy widzów, tarasu widokowego, dróg dojazdowych czy ścieżek pieszo–rowerowych. Wartość umowy wynosi 9 400 000 zł netto. Built by ABM SOLID SA Institute for Health Protection of the State Higher Vocational School in Tarnów is already well advanced. Using the good weather and warm days, ended the elevation of the campus. Buildings are being prepared for winter. Underway finishing works inside buildings. All work carried out in accordance with the schedule so that all work can continue in spite of the coming winter. Commissioning of the campus buildings, the gym, indoor swimming pool and a teaching building to finish before the start of the academic year. October 26th 2011 ABM SOLID S.A. has signed the contract with Budimex S.A. - Oddział Budownictwa Komunikacyjnego Północ in Warszawa. Contract has been signed on fabrication, supply and final assembly of the steel bridge structure including anti-corrosion protection for the realization of the project: "Access roads to the City Lublin ring road" - extension of the Mełgiewska Street into route exit "Małgiew" within express roads S12, S17 and S19 route. Total net value of the contract is 7.686.953,24 PLN. September 23rd 2011 ABM SOLID S.A. has signed a contract with Podkarpacki Zarząd Melioracji I Urządzęń Wodnych with the seat in Rzeszów. Subject of the contract is realization by ABM SOLID S.A. investment: Strug segmental reconstruction stage I - creating longitudinal section and cross the river over a length Strug 8.62 km in Rzeszów and Tyczyn, Podkarpacie Region. The scope of this contract includes: preparatory works, earthworks and the strengthening of the trough, earth structures, and staple finishing work on the Hermanówka stream. Total value of the contract is 17.007.632,81 PLN net. 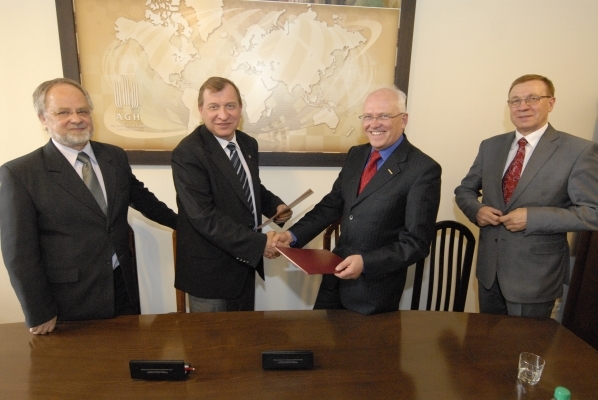 August 12th, 2011, ABM SOLID S.A. signed an agreement with the BIOM Sp. z o.o. The K-9 contract signed by the ABM SOLID S.A. covers the design and execution of works in the Waste Treatment Facility in Koszarówka. The value of the contract is 16 453 287 PLN net. Aug. 8th, 2011, ABM SOLID SA, acting on behalf of the Consortium companies: ABM SOLID SA - the leader of the Consortium and Mostostal Zabrze Zakład Montażowo – Produkcyjny "Częstochowa" Sp. z o.o. - Partner of the Consortium signed a contract with CEMEX Poland Sp. z o.o. located in Warsaw. The subject of the contract is delivery of steel structures and installation of technological equipment for the task: "The construction of silos in the clinkers 2x125 000 volumes in Cementownia Chelm". June 6, 2011, ABM SOLID S.A. signed a framework agreement with TAURON Ekoenergia. ABM SOLID S.A., through its newly established special purpose companies to build and opperate the 11 plants in the four voiwodships: Lower Silesia, Opole, Malopolska and Silesia. The total generated power is being planned for 20 MW. The cooperation project has been written out up to the end of 2015. Each installation will have 1-2.5 MW of power. After starting the operation of the biogas plant, ABM Solid is going to sold 100% of shares in individual companies to TAURON Ekoenergia. Signing an agreement with TAURON Ekonergia will allow the Company to accelerate development in the energy sector. This contract may provide ABM SOLID not only a significant source of revenue in the coming years, but also allows to extend competencies in the green energy sector. April 12th 2011 in Kraków, ABM SOLID S.A. represented by the President of the Board of Directors Mr Marek Pawlik, has signed with University of Science and Technology in Kraków represented by Vice-Rector for Cooperation and Development professor Jerzy Lis and Dean Piotr Tomczyk, Ph.D., associate professor an agreement of cooperation. The foundation of the cooperation is going to be R&D of new technologies, renewable sources knowledge distribution, promoting innovating and energy-saving technologies in construction and specialist staff training. The Chamber of Energy Commerce and Environment Protection in March 2011, admitted the ABM SOLID S.A. as a member of the Chamber. This is another step after the creation of Bioenergy Branch and the creation the company ABM BIOGAZ Sp. z o.o. in strengthening the Companys position on highly perspective bio-energy market. On April 4th 2010 daily news paper Polska The Times Gazeta Krakowska, Tarnów’s supplement, published an article “Energy-saving houses in Tarnów?”. Paper informs that Tarnów might become precursor of passive buildings construction. Tarnów City Hall has sign on March 29th 2011 a cooperation agreement with Politechnika Krakowska (Kraków Technical University) and ABM SOLID S.A. PK is going to build laboratory to research passive buildings. It also is willing to cooperate with potential investors and the company which is going to use this technology. Scientists are going to cooperate with Zespół Szkół Budowlanych (Technical Building High School) in Tarnów. ABM SOLID S.A. has agreed to take on the students from PK and ZSB into internship programs within the company. March 29th 2011 ABM SOLID S.A. represented by Mr. Marek Pawlik, company CEO has signed with Gmina Miasta Tarnowa (Tarnów City) represented by the City Mayor Mr. Ryszard Ścigała and Politechnika Krakowska (Kraków Technical University) represented by The President professor Mr. Kazimierz Furtak, an agreement to work together in the field of research, development and distribution of the knowledge and education and erection of the passive, energy-saving and intelligent buildings. The partners of the agreement, will together utilized their potentials in the scope of knowledge distribution and promoting energy-saving and intelligent solutions in building industry and renewable energy sources, what will transfer into organization of the seminars, conferences and workshops. ABM SOLID S.A. is willing to take part into realization of the passive (energy-saving) and intelligent buildings and human resources development, including internships for Kraków Technical University students. Agreement was signed on the five year period. March 28th 2011 Puls Biznesu published an article "ABM Solid believes in biogas plants." The article highlights that the construction of biogas plants is the key objective of the Company for the year. The cost of building the plant with a capacity of 2 MW is about 30 mln PLN. "This year we want to start building one or two subsequent years, even 5-6 [plants] per year. In the future we will create a company that will manage them. It will be a significant component of our profits. " said Marek Pawlik. Further in the article the President explained that "the entry into new segments and the crisis caused that we implemented several contracts with low profitability. Today our portfolio is much better. Last year, we have developed nearly 470 mln PLN revenues, and the current value of the contracts is 630 mln PLN, of which 460 mln zł for this year. We made offers on about 1 billion zł. This will allow the maintenance of not less than the revenue growth to date. March 29th 2011, Puls Biznesu in the article "Six Technical pearls of the spring", on the basis of technical experts, who chose the most promising company of the spring. In this article ABM SOLID S.A.has been selected as one of the six pearls of Stock Exchange in the spring. Thomas Gessner, an analyst at BDM Brokerage House believes that ABM SOLID S.A. in recent months has been substantially overestimated, in the meantime there was no stronger upward adjustment. Taking into account the technical sold out in conjunction with attempts to reduce the growth rate decrease,it can be assumed that demand at current levels will try to initiate growth. March 28th, 2011, ABM SOLID S.A. has signed two contracts with Foster Wheeler Energia Polska Ltd. The signed contracts to perform construction work for Elektrownia Połaniec S.A.. The total value of both contracts amounts to 8.999.000 PLN net. The deadline was set for 30 September 2011. On February 24th 2011 ABM SOLID S.A. signed a significant contract with the MPGK Ltd. in Katowice. ABM SOLID S.A. will design and build facilities to reduce the flow of waste to the landfill target, in accordance with EU rules. ABM SOLID S.A. will construct three halls: the admission of waste, sorting and production of alternative fuel and alternative fuel storage. In addition, the company will prepare the system for the administration of the organic fraction, the transport system and administration of the prepared fuel from the sorting hall to a warehouse. The value of the signed contract is 18 609 902.35 PLN net. Being built Institute for Health of the Państwowa Wyższa Szkoła Zawodowa in Tarnow. Have been completed and the stage of concrete foundation wall construction. Construction crews began the exercise of internal installations. Takes the raw performance of buildings, initial installation of the Interior. In the near future will be mounted on the roof design a sports hall and swimming pool. Expansion of university campus includes the construction of a sports hall, indoor swimming pool and a teaching building. The investment is planned in July 2012. Puls Biznesu magazine held a contest for "Listed Company of the Year." ABM SOLID S.A. ranked at 77 place (out of 100 companies) of the main ranking of the listed companies in 2010 with a total score of 61.9 points. Selection was made by specialists in capital markets: stock market analysts, investment advisers and brokers during the telephone survey conducted by Pentor. ABM SOLID S.A. recorded one of the biggest promotion in the rankings compared to the previous year. He was promoted to the position 201. February 4th, 2011, the Company ABM SOLID S.A. signed an agreement with Przedsiębiorstwo Wodociągów i Kanalizacji w Brzesku Ltd. The contract is a contract 'Construction of sewage system in the northern city of Brzesko - Phase I'. The contract is 5 938 931.40 PLN net. January 31st, 2010 ABM SOLID S.A. signed an agreement with the Zakład Unieszkodliwiania Odpadów Komunalnych Spytkowo Ltd. with its seat in Giżycko. The subject of the agreement is the construction of Municipal Waste Treatment Plant Spytkowo. The contract is 26 329 000 zł net. ABM SOLID S.A. in the ranking “Forbes’Diamonds” in the category “companies with the revenue over 250 million PLN” has reached 6th position in Małopolska Region. In the ranking of the highest rate of return for the year 2010, published on January 26th 2011 by „Parkiet” polish economical newspaper, ABM SOLID S.A. reached 17th position (in the category of the companies with the capitalization below 100 million PLN on the and of year 2009). ABM SOLID S.A. receives over 26 million PLN net for the construction of waste treatment plant in Spytkowo. Construction is expected to be completed in November 2012. The total usable area of the plant will amount to 4.7 thousand m2. Department will accept 40 thousand tonnes of waste per year. This is the first major contract signed by the company in the Warmia and Mazury. Agreement increased the company's order backlog for the current year to nearly 400 mln PLN in 2010, during the same period was worth slightly more than 270 million PLN. ABM SOLID S.A. in the Polish Market magazine rankings (ranking of the largest building contractors in 2010) was on the 16th position of 225 127 thousand PLN sales revenue during the first 9 months of 2010 was 2 578 thousand PLN net profit and equity of 82 645 thousand PLN. On Dec 4th 2010, the first unit was opened in Bochnia Shopping Center "Rondo." Investment was the general contractor ABM SOLID S.A. company and the investor, CD Locum Ltd. The building has an area 19.9 thousand m2 and 140 thousand cubic m3. November 25th, 2010 the Consortium of companies: ABM SOLID S.A. - the leader of the Consortium, the ABM SILESIA Sp. z o.o. - Partner of the Consortium signed a contract with the Przedsiębiorstwem Wodociągów i Kanalizacji Żory Sp. z o.o. The contract is a comprehensive arrangement of water and wastewater management in Żory. The contract is 11 946 293.03 PLN net. On November 9th 2010 a consortium of companies: 1. ALSTOM Power Sp. z o.o. - Leader of the Consortium, 2. ABM SOLID S.A. - A member of the consortium, 3. ALSTOM Power Sweden Aktiebolag - Member of the Consortium signed a major contract with PGE Górnictwo i Energetyka Konwencjonalna S.A., established in Bełchatów, Bełchatów Branch Power Station. The subject of the agreement is the modernization and repair of electrofilters boilers BB-1150 Units 7-12 of the Power Station. The net value of the Contract for the Consortium is 199 050 000 PLN including the ABM SOLID S.A. accounts for 88 795 837.29 PLN. October 1st 2010 a consortium of companies: ABM SOLID S.A. - the leader of the Consortium, the ABM SILESIA Sp. z o.o. - Partner of the Consortium signed a contract with the Przedsiębiorstwo Wodociągów i Kanalizacji Żory Sp. z o.o. The contract is a comprehensive arrangement of water and wastewater management in Żory. The contract is worth 8 776 273.61 PLN net. On September 30th 2010 ABM SOLID S..A purchased 10 592 shares representing 98.07% of the share capital of Przedsiębiorstwo Robót Inżynieryjnych Budownictwa Sp. z o.o. in Olsztyn. ABM SOLID S.A. acquired the above shares at the price of 38,253,900 zł. Purchase of shares PRIB Sp. z o.o. is associated with the implementation of long-term strategy whose elements include strengthening the offer provided by the Group ABM SOLID services, which specializes PRIB Sp. z o.o. and territorial development of the Group, based on the company for other activities undertaken by it. September 21th, 2010, ABM SOLID S.A. signed a contract with the District Court in Tarnów. The subject of the agreement, a comprehensive execution of works in the investment task called the "Extension of the District Court and Regional Court in Tarnów and District Prosecutor's Office and the Prosecutor's Regional Office in Tarnów". The contract is 14 424 065.24 PLN net. September 14th, 2010, ABM SOLID S.A. signed a contract with Stölzle Częstochowa Sp. z o.o. with its seat in Częstochowa. The subject of the agreement is a comprehensive implementation of the new buildings within Glassworks Employer in Częstochowa. The value of signed contracts is 46 000 000 PLN net. August 20th 2010 a consortium of companies: ABM SOLID S.A. - leader of the consortium, WĄS-BUD - Member of the Consortium, WĄS-BUD Józef Wąsowicz - Member of the Consortium, the Community WIeliczka has signed three contracts for Mine Activities: Construction of sewage in Wieliczka pers. Garden, building sanitary sewers in the village Śledziejowice, construction of sanitary sewers in the village Kokotów. The total value of signed contracts is 18 332 704.62 PLN net. ABM SOLID S.A. has sign contract with AQUA S.A. company on building water and sewage network in Bielsko-Biała. ABM SOLID S.A. will construct 61 km of the network. Total value of the contract is 28,2 millions PLN net. ABM SOLID S.A. is currently working on 13 contracts on water and sewage networks with 530 km of total length of the network, and with almost 270 millions PLN of total net value. On July 9th 2010 a consortium of companies: ABM SOLID S.A. - the leader of the consortium, Wąs Bud Sp. Ltd. - Member of the Consortium, Enterprise Road Construction WĄS-BUD Józef Wąsowicz - Member of the Consortium signed an agreement with Sądeckie Wodociągi Sp. z o.o. The object of the agreement is the construction of water supply and sewerage system under contract No. 1 of the project "Modernisation and extension of water and wastewater of the city of Nowy Sącz in adjacent areas of neighboring communities." The value of signed contracts is 16 159 501.19 PLN net. On July 8th 2010 ABM SOLID S.A. signed a contract with the Community Rytro. The subject of the agreement is to build a sports hall at the Gymnasium in Rytro. The value of signed contracts is 6 078 502.47 PLN net. On July 2th 2010 a consortium of companies: Ruukki POLAND Sp. Ltd. - Leader of the Consortium and the ABM SOLID S.A. - partner consortium signed two contracts to Foster Wheeler Energy Polska Sp. z o.o. The object of these agreements is the execution of construction works and supply and erection of steel structure for Elektrownia Połaniec S.A. The total value of the two agreements for the consortium is 48 153 474.07 PLN net including ABM SOLID S.A. account for the amount of 18 334 691.25 PLN net. On June 30th 2010 ABM SOLID S.A. on behalf of a consortium of companies: ABM SOLID S.A. - the leader of the consortium, Instal Białystok S.A. - partner consortium signed a contract with the Community of Wrocław City - Municipal Board of Investment. The subject of the agreement is the construction of the Nursery School and Recreation Complex - Sports. The value of signed contracts is 25 470 453, 40 PLN net. On June 29th 2010 ABM SOLID S.A. signed an agreement with Wodociągi i Kanalizacja Krzeszowice Sp. z o.o. The object of the agreement is the construction of sewers in: Nawojowa Góra, Paczółtowice and Krzeszowice under the project "Ensuring proper waste water management in the urban area Krzeszowice - No WIK-I/10". The value of signed contracts is 15 266 494.08 PLN net. On June 28th 2010 as a subsidiary of ABM WSCHÓD Sp. z o.o. with its seat in Tarnów (General Contractor) has signed a significant contract with TOW 'Proskuriv Kormomiks', based in Ukraine. The object is to implement the agreement signed by the ABM WSCHOÓD Sp. z o.o. manufacturing plant feed. The value of signed contracts is U.S. $ 4 235 294 including VAT in accordance with current legislation of Ukraine. On May 20th 2010 ABM SOLID S.A. signed an agreement with the Community of the City Oława. The subject of the contract is to build an indoor swimming pool in Oława. The company will build a swimming pool with sports basin. In addition to a leisure pool with water attractions, paddling pool for children, two Jacuzzi tubs, a team of rehabilitation and health club with saunas, a cryogenic chamber, solarium, massage and beauty of physicians - surgical. Value of the contract is signed 18,288,990.02 PLN net. 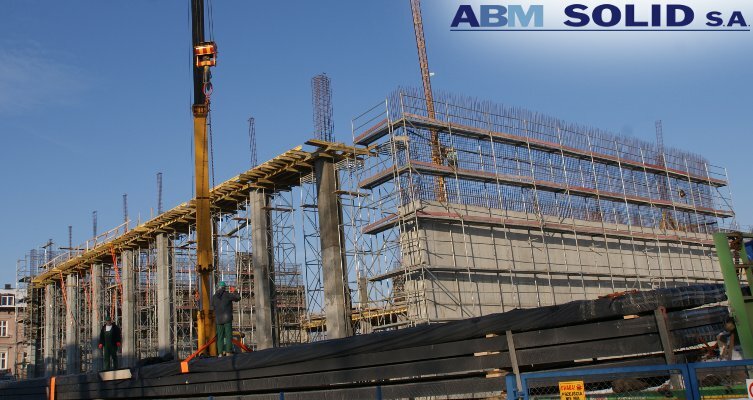 On May 13th, 2010, ABM SOLID SA signed a preliminary contract to acquire over 50% domestic share a limited liability company operating in the construction segment. Signing the agreement is the realization of the long term strategy of ABM SOLID S.A. and complements the area of the Capital Group ABM SOLID. April 26th 2010 ABM SOLID S.A. sign a contract with Politechnika Wrocławska. Subject of the contract is constructing Center of Advanced Studies of Information and Communication Technologies, realized on the frames of project "Intercollegiate Education and Technology Center "Technopolis" in Wrocław" - localized on the Janiszewski St. 11th-17th. Total net value of the contract is 19.162.112,00 PLN. In new constructed buildings will be placed modern auditoria and seminar rooms, laboratories, other education facilities including unique on the national scale facilities with controlled environmental parameters. For acoustic experiments facility will be equipped with modern acoustic cabin. April 20th, 2010, ABM SOLID S.A. signed a contract with Zakłady Drobiarski 'DROB-BOGS' Jacek Boguslawski, based in Kaleń. The subject of the contract is to build a slaughtering and cutting poultry component facility with the cold store, flour and fat production with social, office, commercial and technical infrastructure. The facility will be equipped with modern instalations and technologies of poultry slaughtering and processing, waste disposal and the production of flour. ABM SOLID S.A. will cooperate with this procect with specialized companies from Spain and the Netherlands. The net value of contracts is 22.700.000 PLN. On April 8th 2010 a consortium of companies: Instal Białystok S.A. - the leader of the consortium, ABM SOLID S.A. - partner consortium, FALUBAZ S.A. - partner consortium, signed a contract with the Łomża City. The subject of the agreement is to build a waste treatment and disposal facility for the City of Łomża and surrounding communities, as a part of the project "Construction of municipal waste management systems for the city of Lomza and surrounding municipalities". The total net value of the contract is 8.194.784,51 PLN. March 30th 2010 ABM SOLID S.A. sign contract with Ministry of Treasury in which bought 20.400 shares (85% of the company’s capital) of the company Wągrowickie Przedsiębiorstwo Robót Mostowych Sp. z o.o. with the seat in Wągrowiec. ABM SOLID S.A. has bought those shares for the price 5.250.000 PLN. Acquisition of WPRM Sp. z o.o. is connected with long term development strategy, which includes strengthening and widening the offer of the services provided by ABM SOLID Capital Group in particular in bridge building sector in which WPRM Sp. z o.o. operates, and territorial expansion of Capital Group for it’s other activities. March 29th 2010, ABM SOLID SA signed an agreement with Karpacka Spółka Gazownictwa Sp. z oo with its seat in Tarnów. The subject of the agreement is to build a administrative office building together with the technical segment and land development. The total net value of the contract is 19.244.767,21 PLN. March 1st 2010 ABM SOLID S.A. signed the contract with Akademia Wychowania Fizycznego in Kraków. Contract is signed on constructing indoor swimming pool complex with R&D infrastructure of AWF Kraków. Total net value of the contract is 19.956.325,69 PLN. December 10th , 2009 during auction organized by Ministry of Treasury, ABM SOLID S.A. submitted the best offer for the purchase of 20.400 shares comprising 85 % of share capital of the Wągrowieckie Przedsiębiorstwo Robót Mostowych Sp. z o.o. with the registered office in Wągrowiec. The value of the offer is 5 250 000 PLN. The purchase of this company will supplement business activities of ABM SOLID S.A. The Group will gain new competences in construction of the reinforced concrete bridge’s structures. Thanks to take over of WPRM, the Group will also gain a concrete prefabricated plant. Acquiring this enterprise will strengthen activity and the competitive position of ABM SOLID Capital Group on the road and rail bridges sector. December 9th, 2009, ABM Solid S.A. has signed a contract with the Community Szydłów. The object of the signed agreement is to build a sewer system with the sewage treatment plant in Szydłów - stage I . The total net value of signed contracts is 5 483 792.72 PLN. December 4th, 2009, ABM SOLID S.A. has signed a contract with the Miejski Zakład Gospodarki Komunalnej Sp. z o.o. in Nowa Sól. The object of the signed agreement is to build a sewer system in Otyń Community. The total net value of signed contracts is 5 136 987.79 PLN. November 6th 2009, ABM SOLID SA signed an agreement with SPORT PLESZEW Sp. z o.o. on building a sports complex in Pleszew which will include an indoor swimming pool, bowling, fitness and a gym, dining facilities, sporting goods store, parking lots and the necessary infrastructure. The total net value of the contract is 16.379.224,65 PLN. November 4th 2009, ABM SOLID SA signed a contract with CD LOCUM Sp. z o.o. on construction of the Shopping Mall RONDO in Bochnia. Total value of the contracts is 45 000 000 PLN net. November 4th 2009, ABM SOLID SA signed a contract with Gmina Klobuck. The object of the signed agreement is to build a sewer system in localities: Kłobuck - Smugi, Kamyk, Borowianka, Łobodno, Kopca. The total net value of contracts is 20 565 909.84 PLN. October 16th 2009, ABM SOLID S.A. sign contract with Państwowa Wyższa Szkoła Teatralna (PWST) in Kraków on realization of modernization and enlargement of the building of PWST Branch in Wrocław. Total value of the contract is 24.391.602,49 PLN net. September 3rd 2009 ABM SOLID S.A. received commission from Nestle Waters Polska S.A. – Production Facility in Nałęczów. Subject of the commission is erection storage hall for finished products with social part and building associate infrastructure of Production Facility "Nałęczowianka". Total net value of the commission is 16.690.000 PLN net. 24th August 2009, consortium consisted of ABM SOLID S.A. (consortium leader) and Przedsiębiorstwo Robót Inżynieryjnych BUD-MOST Sp. z o.o. (consortium partner) sign contract with PKP Polskie Linie Kolejowe S.A. Contract has been sign on executing project documentation design and assembly of temporary steel structure for rail bridge modernization on rail line E 65. Total net value of the contract is 8.200.000 PLN. 24th August 2009 consortium consisted of RESBUD S.A. (consortium leader) and ABM SOLID S.A. (consortium partner) sign contract on realization “New Technologies Project Center OPTeam S.A.”, which will be build in Tajęcin (near Rzeszów). Total net value of the contract is 12.694.042,97 PLN. August 18th 2009, ABM SOLID S.A. sign contract with Kłodzko Community on realization multipurpose in-door swimming pool with preparing execution documentation, localized by Elementary School No.3 in Kłodzko. Total net value of the contract is 15.803.000,00 PLN. July 20th 2009 ABM SOLID S.A. signed with Plast-Dach Sp. z o.o. from Myślenice contract on realization construction and assembly works connected with building production and storage facility in Myślenice. Total gross value of the contract is 8.540.000 PLN. July 17th 2009 ABM SOLID S.A. signed two contracts with Tarnowskie Towarzystwo Budownictwa Społecznego Sp. z o.o. w Tarnowie, on realization of constructing two multi-habitation buildings 7/TBS and 8/TBS localized in Tarnów with technical infrastructure and organizing surrounding area. Total value of the contracts is 15.944.205,14 PLN net. June 30th 2009 ABM SOLID sign the contract with Sobków Community. Contract has been sign on building sanitary sewers and enlargement of the sewage treatment plant in Sobków Community, II stage. Total net value of the contract is wynosi 5 723 117,46 PLN. June 23rd 2009 ABM SOLID sign the contract with Sędziszów Community on building sanitary and rain sewers and rebuilding sewage treatment plant in Sędziszów. Total net value of the contract is 6 164 910,58 PLN. May 12th 2009, ABM SOLID S.A. has sign the contract with Mielec City. Contract has been sign on extension of MOSIR’s out-door swimming pool in Mielec. Total net value of the contract is 3 662 798,40 PLN. April 15th 2009 consortium consisted of: ABM SOLID S.A. (as a leader of consortium) and INSTAL LUBLIN Sp. z o.o. sign the contract with Legnica City. Consortium is going to build in-door swimming pool next to Primary School no 4 in Legnica. Total net value of the contract is 12.276.867,02 PLN. on 30 March 2009 the Management Board of ABM Solid S.A. adopted a resolution on the intention to merge ABM SOLID S.A. ( as the acquiring company ) and RESBUD S.A. The Management Boards of the Companies, taking into consideration the cooperation of the companies up to date, the willingness to build a strong business entity to carry out construction tasks admitted that the most clear form of integration, enabling to achieve the synergies assumed will be the merger of ABM SOLID S.A. and RESBUD S.A. The merger will enable: optimization of costs of activity, allocation and concentration of service activities, more efficient use of operating potential and assurance of possibility to develop the activities currently run by RESBUD S.A. through facilitation in gaining long-term investment financing, winning new clients and orders. The merger will involve restructuring of RESBUD S.A., through increase of efficiency in winning orders. March 3rd 2009, ABM SOLID sign with Uniwersytet Pedagogiczny in Krakow, contract on building didactic building for the University with technical infrastructure, as a part of the project “Enlargement of the Pedagogic University in Kraków”. Total value of the contrac is 18.835.800 PLN net. January 14th 2009, ABM SOLID sign with Miejski Ośrodek Sportu i Rekreacji in Mielec, the contract on building in-door swimming pool in Mielec, 2nd stage, which consist of finishing the building, external construction and infrastructure. Net value of the contract is 13.098.355,74 PLN. January 6th 2009 – the Board od Directors of ABM SOLID S.A. is informing that on Dec. 31st 2008, Registry Court in Kraków, Section XII Economical, National Court Registry, has registered fusion of the companies: ABM SOLID S.A. (the acquiring company) and RES-ALMET sp. z o.o. (the target company). Fusion of the companies has been done under principles of article 492 § 1 point 1 of the Companies Code through bringing on all RES-ALMET sp. z o.o. assets into ABM SOLID S.A. The target company will sustain its operation profile, staff and will be continuing its past and present operations. In the structure of ABM SOLID S.A. target company will be functioning as a branch under name RESALMET Rzeszów. November 24th 2008 consortium of ABM SOLID S.A. (lider) and RESBUD S.A. sign with Gmina Miasta Bochnia contract on building sport hall in Bochnia with social and administration part. Total value of the contract is 11.432.630,91 PLN net. November 7th 2008, ABM SOLID S.A. sign with Miejskie Przedsiębiorstwo Wodociągów I Kanalizacji sp. z o.o. in Piekary Śląskie, the contract on building savage and water system in Piekary-Centrum district in Piekary Śląskie. Total value of the contract is 7.284.710,99 EURO net. October 11th 2008 ABM SOLID S.A. sign with Mościckie Centrum Kultury in Tarnów, the contract on designing and modernizing MCK facilities. Total value of the contract is 17.212.176 PLN net. August 22nd 2008, ABM SOLID S.A. sign with Miejskie Przedsiębiorstwo Oczyszczania sp. z o.o. in Kraków the contract, on designing and building facility for dismantling high sized solid waste, and electric and electronic appliances with its collection spot in accordance with Project ?Solid waste management in Kraków, Stage I?. Net value of the contract is 4.449.988 EURO. July 22nd 2008 ABM SOLID S.A. signed with Miejski Ośrodek Sportu i Rekreacji in Mielec, contract on building in-door swimming pool in Mielec. Net value of the contract is 5,6 million PLN. 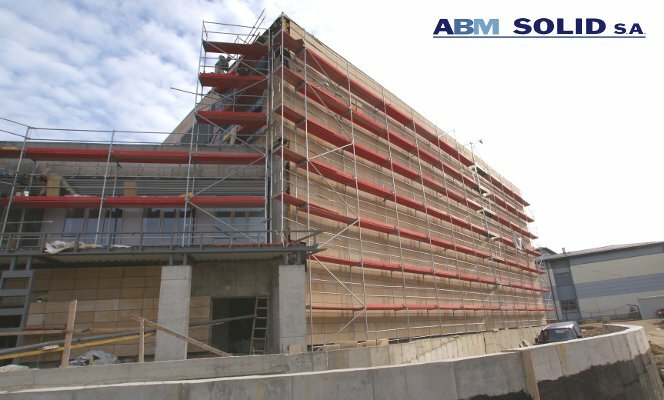 July 16th 2008 ABM SOLID S.A. signed the contract with POLPLAST POLSKA on constructing and building production and storage facility in Myślenice. POLPLAST POLSKA Sp. z o.o. is a part of the French group GMD, which is one of the largest producer of the plastic parts and components in the world. Net value of the contract is 9,2 million PLN. During last 12 months ABM SOLID has signed with POLPLAST POLSKA two contracts on the total value 14,2 millions PLN. July 14th 2008 ABM SOLID S.A. buy out the rest of the stocks of PPU TRANS-ENERGO S.A. After transaction ABM SOLID S.A. has 700 stocks of PPU TRANS-ENERGO S.A. which are 100% of the capital and 100% of the votes on the general meeting of stockholders. June 30th 2008 ABM SOLID S.A. signed with Miejskie Przedsiębiorstwo Oczyszczania Sp. z o.o. in Krakow contract on designing and building storage facility for solid waste with high sized solid waste collection spot. Net value of the contract is 2.407.936,23 EURO. June 26th 2008, ABM SOLID S.A. signed a contract of the net value of 28,9 milion PLN, with POL-AM-PACK S.A. who is a member of the CAN PACK S.A. Group. Object of contract which is going to be completed on January 30th 2009 is construction of production and storage facility with external infrastructure in Glass Works "Orzesze". June 13th 2008 new corporation ABM WSCHÓD sp. z o.o. was established. ABM SOLID S.A. take over 51 % of the shares, and RESBUD S.A.take 49% of the shares. New corporation was established to carry on business operation in the field of construction into East Europe. June 10th 2008, ABM SOLID S.A. as a lider of the consortium, has sign with Intercommunal Ecology Association in Żywiec, the largest contract in the company history, on building sewage system in Łodygowice. According to the contract, consortium is going to build 220 km of sewage lines and 66 sewage pomp stations. Contract works are going to be done in the Łodygowice community and surroundings. Total value of the contract reaches almost 120 million PLN gross. On 11th of December 2007, ABM SOLID S.A. signed a contract with Malopolskie Towarzystwo Budownictwa Spolecznego TBS-Malopolska S.A. in Cracow for construction of multi-family four-storey flat building in Skawina (building number 4). Gross value of the contract is 5 144 541.08 PLN. On 10th of December 2007, ABM SOLID S.A. purchased a part of enterprise called Steel Structures Production Plant in Grybow (WKS Grybow). WKS Grybow produces the structures of road bridges and railway bridges, fly-over constructions, footbridges for pedestrians and vehicles, hall and shelter constructions, roofings and other bridge facilities. This purchase concerns a development of ABM SOLID's activity in construction sector. On 3rd of December 2007, ABM SOLID S.A. signed two contracts with CP-RE Sp. z o.o., the Company of CAN-PACK Capital Group, for construction works. Both contracts concern the investment called "Construction of storage hall for CP-RE in Brzesko". Total value of the contracts is 14.3 mln zl. On 19th of November 2007, ABM SOLID S.A. signed a contract with Malopolskie Towarzystwo Budownictwa Spolecznego "TBS - Malopolska" Sp. z o.o. in Cracow for construction of four-story flat building in Skawina. Contract value is 8 710 850.73 PLN. On 15th of October 2007, ABM SOLID S.A. signed a contract with Bedzin Commune, Silesian voivodeship. The contract includes: preparatory works, sewage systems, works of rain water sewage system, waste water pumping station, maines of water-supply, reconstruction of road elements, energy supply of pumping station. Contract value is 9 275 437.23 EURO Gross. On 15th of October 2007, ABM SOLID S.A. took over almost 100% of shares of Company PPU TRANS-ENERGO S.A. with its seat in Radom. Acquired Company has strong position on the market of engineering, construction and assemby services. TRANS-ENERGO provides electric and telecommunications services for industrial plants, power engineering, telecommunications, construction industry, mines and chemical plants. Acquired Company will supplement current activities. Thanks to this, ABM SOLID Capital Group will be able to execute construction projects more comprehensively. On 4th of October 2007, ABM SOLID S.A. signed an agreement with Gmina Miejska Kraków which acts on behalf of Miejskie Przedsiębiorstwo Wodociągów i Kanalizacji S.A. in Cracow. Subject of the agreement is recultivation of sludge lagoon. Contract value is 6 795 628,21 EUR gross. On 26th of September 2007, ABM SOLID S.A. signed an agreement with Miejskie Przedsiebiorstwo Wodociagow i Kanalizacji in Bochnia Sp. z o.o. Building and renovation of sewage system in Bochnia is the subject of the agreement. Value of this contract is 5 978 311 EUR gross. On 23rd of August 2007, Consortium who consists of ZIB Fajkier Registered Partnership (Consortium leader) and ABM SOLID S.A. signed contract with Gmina Zawiercie 3 for execution of sanitary sewage system in Gmina Zawiercie. Total value of this agreement is 14 324 290 EUR gross. From this amount about 6 062 873,18 EUR gross fell to ABM SOLID S.A.
On 24th of July 2007, ABM SOLID S.A. made its debut on the Warsaw Stock Exchange S.A.
On 20th of July 2007, ABM SOLID S.A. signed a contract with Jeronimo Martins for the execution of the building works and finishing works for the logistics centre's erection in Grudziadz. On 4th of July 2007, ABM SOLID S.A. signed a contract with Tarnowskie Towarzystwo Budownictwa Społecznego Sp. z o.o. for the execution of the multi-family habitable buildings 6IIe./TBS and 9/TBS at Abpa J. Ablewicza Street in Tarnow. On 28th of June 2007, took place a press conference of ABM SOLID S.A.
On 25th of June 2007, Chairman of the Commission for Financial Suprvision by way of the authorisation of the Commission approved Prospectus made by ABM SOLID S.A.
On 30th of May 2007, ABM SOLID S.A. signed a contract for the project called "Execution of the building for Wydział Inżynierii Środowiska i Geodezji Akademii Rolniczej im. Hugona Kołłątaja in Cracow". On 22nd of May 2007, ABM SOLID S.A. signed a contract with Zakład Inwestycji Traktatu Polnocnoatlantyckiego. On 16th of May 2007, the Company changed its seat for 3, Bartla Street in Tarnow. On 19th of April 2007, ABM SOLID S.A. signed a contract for execution of the projekt called: 'Centrum Dydaktyczno-Biblioteczne Podhalańskiej Państwowej Wyższej Szkoły Zawodowej w Nowym Targu'. On 30th of March 2007, ABM SOLID S.A. signed a contract for execution of the project called "Extension of the sports and recreation Complex at Jodlowskiego Str. in Zyrardow". 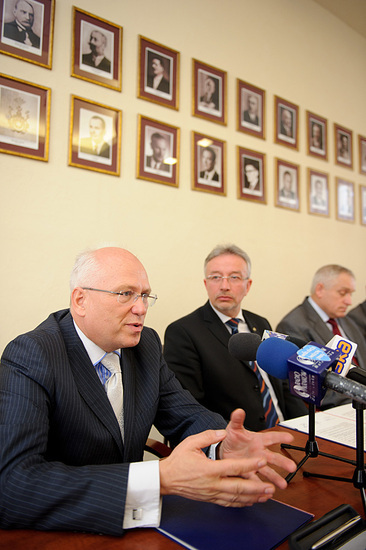 On 27th of March 2007, a press conference of ABM SOLID S.A took place. On 20th of February 2007, ABM SOLID S.A. put forward an Emission Folder to the Comittee of Financial Supervision. On 5th of December 2006, ABM SOLID S.A signed a contract for execution "A Multi-functional Magazine" in Brzesko for the Firm CP-RE Ltd., the CAN-PACK S.A. Group. On 17th of November 2006, ABM SOLID S.A. received a Reward of the Programme 'Fair Business' in the category 'Innovations and Transfer of Technology'. On 31st of October 2006, ABM SOLID S.A. signed a contract with TBS Malopolska S.A. for the erection of a multi-family block of flats together with technical infrastructure at Krakowska-Pisary Str. in Skawina. On 28th of September 2006, ABM SOLID S.A. received a Congratulatory Letter and a statuette from Antoni Jaszczyk, the Minister of Building Trade for realization of the biggest in recent years investment in Krosno; A Plant of Neutralization of Wastes.